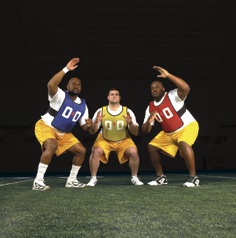 The BUDDY VEST is worn on non-padded days of practice and during off-season conditioning. The vest is fitted with high-density foam which can absorb the shock of a punch. It is held snug to the body by elastic side panels and a back zipper. The vest is numbered to give the appearance of a jersey. At the center is a red “focus line.” It offers maximum protection to your scout team players without restricting their mobility. Go full speed and give your players a “real time” look. Teach your O-line to train their eyes on the target in both run and pass block drills and strike with their hands tight to the breastplate.